I am speaking about Haematoxylum campechianum. 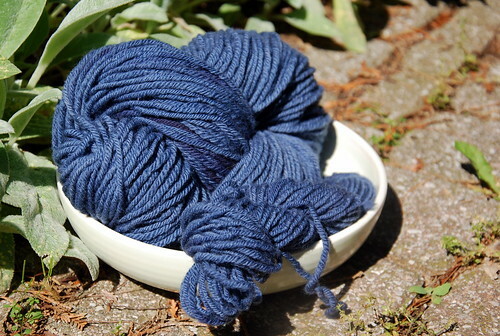 Logwood is a natural dye that is typically sold as dried chips of the heartwood. It was introduced for cultivation in Caribbean colonies, and continued to be exported even through the sugar hey-day. Who do you think you are? Logwood Heart? Moi j’a dire – ‘ous pas prêter un rien. ‘Ous ni shallope, ‘ous ni seine, ‘ous croire ‘ous ni choeur campêche? I told you, borrow nothing of mine. You have a canoe, and a net. Who you think you are? Logwood Heart? My Dad got me this bag of Jamaican logwood about a year ago. Having found this article I learned it was still exported from the island as dyestuff up until the early 1940s. 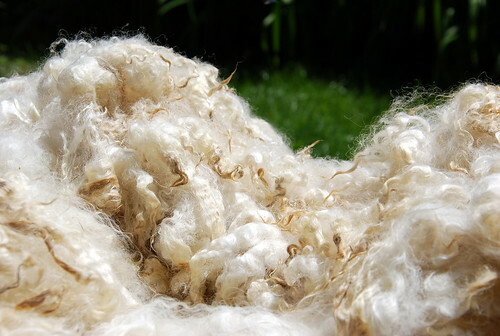 At the end of May, 2011, I took my 53g of shaved and chipped Jamaican logwood and dove into the hand-spun stash. 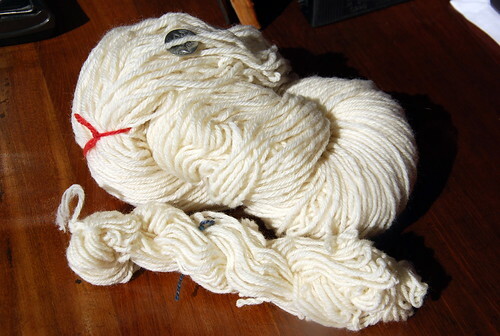 This 464 yds of local organic Romney that I spun on my Spinolution Mach 2 a.k.a. Earl came out to play. For this 278g of fibre, I decided to add in 50g of commercial Logwood chips that I had on hand. The logic seems fuzzy now but I was aiming for purple, and wanted to “save” the precious stuff from home. 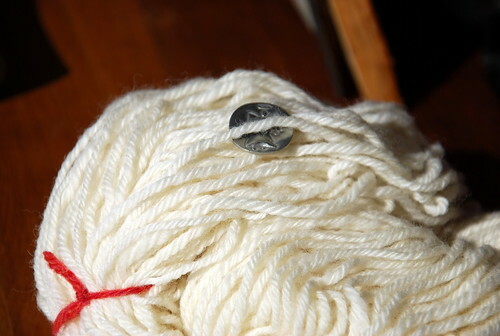 My method was to pre-mordant the yarn (25% alum; 6% cream of tartar). I put all the logwood plus some Lignum Vitae – on advice from back home – in a stocking. That went into the dyepot for a cold water soak overnight. Then I simmered the yarn in the pot for 1 hour, and let the bath cool. I didn’t remove the stocking. It worked! 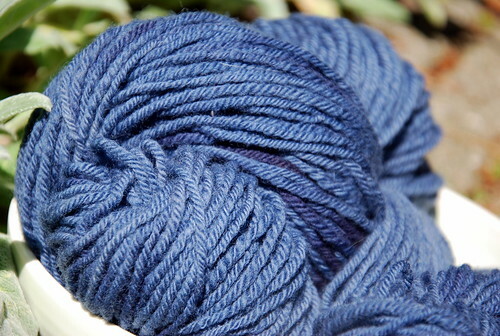 I was (and still am) so excited about this deep, dark purple of natural dyed wonder. I know a good thing when I see it, so the dye pot went straight to the basement. You know, for later use. N had a few qualms along the way but he is a scientist and saw I was making An Experiment. Scientists appreciate experiments. Mold and all. In late November, 2011, I got the urge to dye purple again. 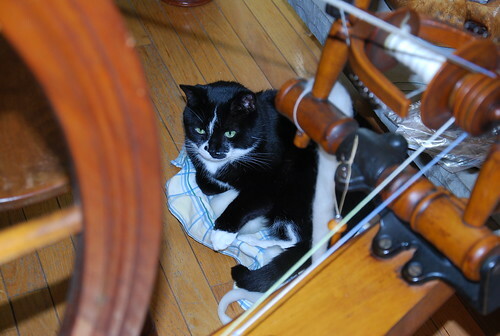 This time it was my hand-spun sock yarn. Mold was the least of my worries. The blobs of inky gunk showed up as soon as the yarn went in. I kept calm, and rinsed in the sink. Thankfully, the blobs agreed to slide right off. As soon as the colour got mauvey, I pulled the skeins out. There’s no point in tempting fate now is there? Fibre: 154g of kid mohair/ merino/ alpaca sock yarn roving from The Fibre Garden. Wheel: Watson Martha in double drive, and spun on the smaller whorl. 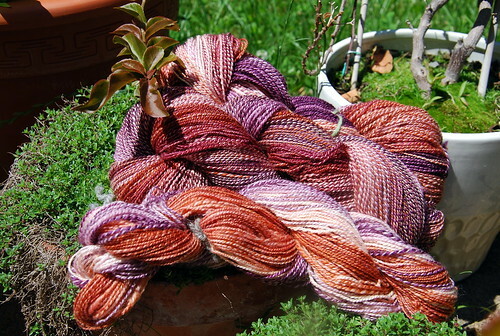 Plied wraps per inch: 16 (sport-weight). Why tell you all of this now? It’s a fair question. The answer is that I have been knitting my first pair of me-spun; me-dyed socks. And I love them very much. The pattern is Clara Parkes’ Stepping Stones from The Knitter’s Book of Socks that N gave me last Christmas. I missed the part where she gives a variation on the stitch pattern for the foot. My little modification was to just twine knit the heel flap. Her instructions have you almost there anyway, and I do love to twine. This is my handspun, naturally dyed and backstrap loom woven bag from The Center for Traditional Textiles of Cusco, Peru. A quiet reminder that I am a young grasshopper in this world rich with textile traditions. 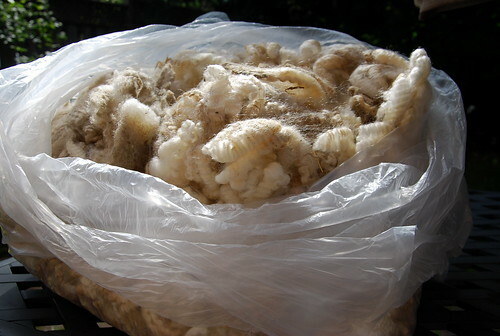 Categories: Getting the knack, Natural Dyes, Spinning, Things Jamaican, Uncategorized | Tags: handspun yarn, Jamaica, Logwood dye, Materials, Romney wool, Sock | Permalink.